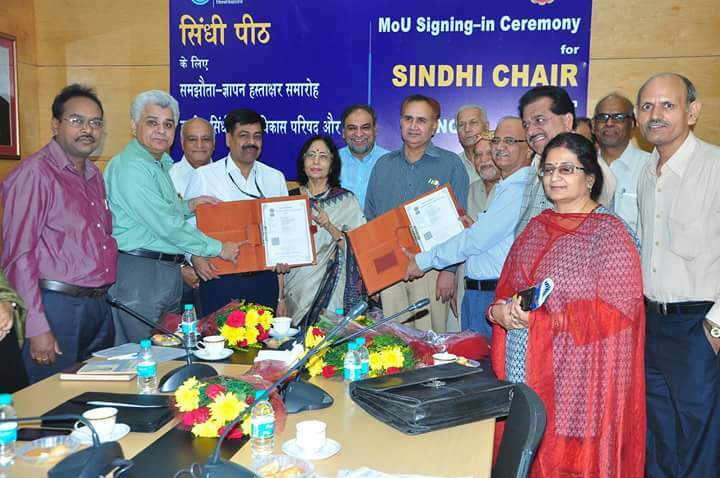 New Delhi, Oct 29 : The Indira Gandhi National Open University (IGNOU) has signed a Memorandum of Understanding (MoU) with National Council for Promotion of Sindhi Language (NCPSL), MHRD, Government of India, for Sindhi Chair at the university’s headquarters in the capital. When we are signing a MoU to take a lead in initiating activities in collaboration with the NCPSL for the study and research of/in Sindhi language, literature and culture, said Prof. Nageshwar Rao, Vice Chancellor, IGNOU. A path of employment and skill development will be formed for the youth people, Rao added addressing the MoU signing-in ceremony for Sindhi Chair. The process to develop P.G. Certificate in Sindhi-Hindi Translation programme has also been started by the School said, Rajendra Prasad Pandey, Director (SOTST). In continuation with these initiatives of the University, a Sindhi Chair has also been established with the sponsorship from National Council for Promotion of Sindhi Language (NCPSL). The activities of this Chair are to be undertaken under the auspices of School of Translation Studies and Training (SOTST), IGNOU . The School Board of SOTST has approved the (a) Appreciation Course in Sindhi (b) Foundation Course in Sindhi (for BDP students) (c) Diploma in Sindhi (with provision for exit after completing first 4 courses to be awarded Certificate in Sindhi) and (d) P.G. Certificate in Sindhi-Hindi Translation programme. The MoU was signed by Ravi P. Tekchandani, Director, NCPSL and Mr. S.K. 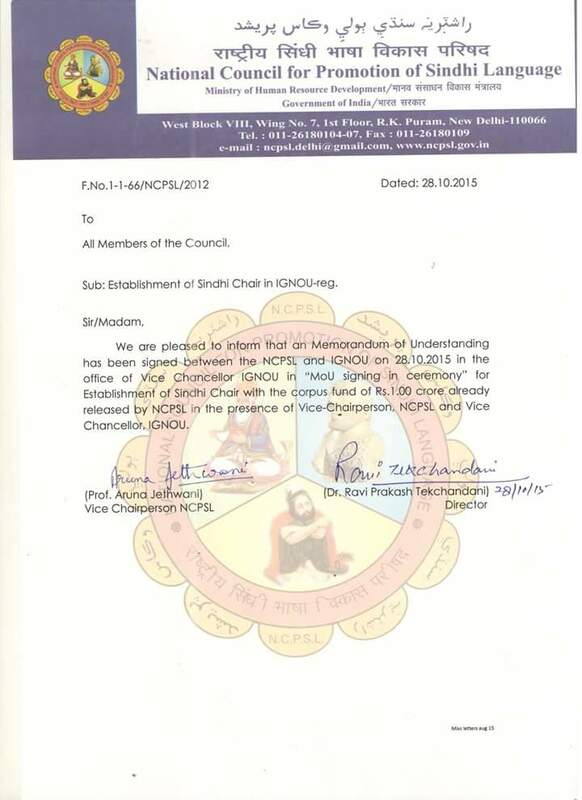 Sharma, Registrar(Administration), IGNOU. The vote of thanks was given by Narayan Prasad, Director, Academic Coordination Division, IGNOU.